As most Pi members know, the club recently upgraded the TCS (TeleCommunications System), which is the Pi's electronic bulletin board. To celebrate the event, I decided to create a small video recognizing the folks who keep the TCS running. Since one of the announcements about the upgrade referred to it as the next generation of the TCS, and since there is a high correlation between techies and trekkies (I'm sorry - trekkers), I decided to go with a Star Trek -- The Next Generation (ST-TNG) parody. There are two versions of the video. If you have the latest version of QuickTime installed, I highly recommend that you download the MP4 version, since the quality is much better. This article is meant to give you a general idea of the work processes and thought processes I went through to create this video. Hopefully it may inspire some of you to expand your video editing horizons a little. While I used some pretty expensive software tools to build this project, I'm sure I could have created a similar, albeit simpler project using a variety of less expensive tools and a little more ingenuity. Legal disclaimer (sort of): I did not create a lot of the images and audio files that I used in this video; rather, I extracted them from various web sites. I am using them to educate others on the video editing process. I like making parodies for two reasons: first, you get to piggyback off of someone else's creativity. Second, as long as your target audience is familiar with the subject being parodied, you don't have to spend a lot of time in your video establishing characters, settings, etc. Instead, by tweaking existing cultural icons, you can quickly get to the funny stuff (hopefully). The tools I used for this project included Maxon Software's Cinema 4D, Adobe's After Effects, Premiere, and Photoshop, and Apple's iMovie and QuickTime Pro. I run all these apps in Mac OS X, primarily because I no longer have to worry about memory allocation with the newer OS. The majority of the work was done on my Pismo (PowerbBook G3), although I did occasionally use my PowerMac G4 to take advantage of its faster rendering abilities. For short video projects, the Pismo can handle all the jobs; it just takes a little longer. By the way, my Pismo has a 20 GB hard drive and 512 MB of RAM. For video recording/playback, I used my Sony TRV-17 miniDV camcorder. Most people are probably not too familiar with Cinema 4D and After Effects, since they are fairly expensive apps for casual users. Cinema 4D is a superb 3D modeling and animation program. After Effects is kind of a time-based version of Photoshop. You bring video, animations, pictures, and audio into After Effects, then you can manipulate these items within a timeline. After Effects is probably my number one animation tool because, like Photoshop, it has incredible depth. You can accomplish a lot just by going through its tutorials, but you can also spend years mastering all the features of this powerful application. After Effects is also well integrated with Premiere (Adobe's video editing program) and Photoshop. Regarding the latter application, because Photoshop and After Effects share so many common filters and effects, a lot of the effects that I applied to still images in this video could have been done using either application (for this project, After Effects was usually my tool of choice, since I had it up and running most of the time). While 3D animation programs tend to have steep learning curves, I find Cinema 4D to be the most intuitive on any that I have used. Years ago, I bought a discounted copy of the low-end version of Cinema 4D, which whetted my appetite for 3D modeling and animation in general. Since then, I've played with numerous 3D apps (mostly demos, because a lot of them are expensive), but for me, none of them were as easy to use as Cinema 4D. And some of them wouldn't run on my lowly G3 computer. One of the reasons I created this project in the first place was that I had recently upgraded to Release 8 of Cinema 4D, and I figured that creating a new project would motivate me to start learning it (I find that the quickest way to learn these kinds of apps is to work through the tutorials and then modify the apropos tutorials to fit the needs of my current project). Since I was starting this project about three weeks before my self-imposed deadline, I knew that my decision to use a 3D animation app would depend whether or not I could find a free pre-fabricated 3D penguin model that I could animate. Fortunately, a Google search produced a 3D penguin (Tux of Linux fame) that fit my avian server needs perfectly. The model's creator, one of the van Heesch brothers, allows his model to be used freely for non-commercial purposes; for more info about 3D Tux, go to: http://www.stack.nl/~fidget/pguin/penguin.html. But would a penguin model stored in 3DS file format work in my 3D app? I quickly installed Cinema 4D and tried importing Tux. It rendered perfectly. So Cinema 4D was a go. I resolved to work through the tutorial booklet that came with Cinema 4D, so that I could re-acquaint myself with the app and its capabilities (if I don't use one of these complex apps on a regular basis, I find that my skills quickly perish). My 3D requirements for this project were fairly simple: (1) I wanted a slow circular pan of Tux/Gentoo; (2) I needed some still images of Tux/Gentoo from several camera angles (which I would animate later in After Effects); and (3) I needed to create a 3D planet or two. Having identified my requirements, I skipped over many of the tutorial lessons that had no relevance to my current needs (I can always go back to the ones I skipped if I need that information for future projects). My original intention was to reproduce, shot-by-shot, the opening sequence of ST--TNG. To accomplish this, I used my camcorder and iMovie to record the opening sequence off my cable TV (it helps that the show airs about a zillion times a week). Having a thumbnail movie as a reference helps immeasurably to get the animation timing in sync with the music and narration. For the opening theme music, I had planned to use music recorded off of my cable TV for the last portion of my opening sequence (since I planned on replacing Captain Picard's voiceover with my own, I knew I would have to find another version of the first portion which didn't include narration). Using Google, I located a MIDI version of the opening music. It didn't sound as good as the orchestral version, but I figured my voiceover would cover up differences between the computer synthesized instruments and the orchestral music from the TV show. I used the audio fade tools in Adobe Premiere to combine the MIDI audio of the first part with the TV recording of the second part. As pleased as I was with my kludge, it all became moot when I stumbled upon an orchestral version of the entire opening sequence -- minus voiceover -- from a Star Trek fan site (I had gone there to find a warp drive sound effect). For my cyberspace background, I had originally planned to use the green falling alphanumerics that are seen in the Matrix movies. One of my After Effects reference books, Creating Motion Graphics, by Trish and Chris Meyer, contains a tutorial for creating this effect. However, I rejected this background for several reasons. First, the bright green had a tendency to bleed when viewed on a TV monitor (some colors look great on a computer monitor, but terrible on an NTSC monitor). Second, I found that all the falling movement in the background detracted from the activities that were going on in the foreground. So I decided to go with a simple grid of 1's and 0's. While this could have been created fairly easily in Photoshop, I opted to use the Grid and particle effects functions in After Effects, which randomly generated the characters for the background. Once this background was created, I then brought it into Cinema 4D and applied it as a texture to the Sky (the Sky is special 3D object, essentially a sphere, that encompasses all the 3D objects you create in Cinema 4D). I then rendered images of the Sky to use as background images in After Effects. As a result, I now had a digital grid that looked more curvilinear than the flat grid I had started with. As I mentioned earlier, my original intention was to reproduce, shot-by-shot, the opening sequence of Star Trek: The Next Generation. That show opens with what appears to be comet streaking into a galaxy. Next, there is a shot of a planet, with a ringed planet appearing behind it. Finally, the starship appears and then warps into the unknown. I was originally going to have the Apple iDisk serve as the comet, streaking into the Apple galaxy. 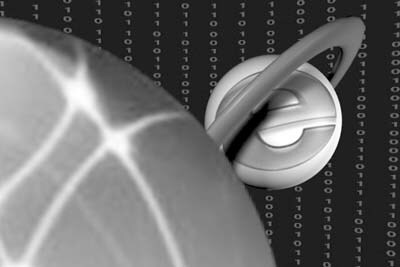 And since the Internet Explorer icon has a ring, it was a natural for the ringed planet. 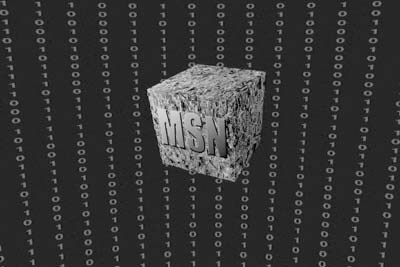 But then I had the idea of adding the Microsoft Network (MSN) Borg ship, so I decided that my homage to Star Trek would not be shot-by-shot accurate, but instead, close enough. Figure 1. The Airport base stations head for The Apple Way. For the opening shot (Figure 1), I enhanced my digital sky background with images of the Apple logo -- both white and rainbow versions-- that I found on a web site. I applied a glow and a blur effect to the white Apple logo, after scaling it down considerably. For the rainbow Apple, I applied a twirl effect, blurred it like crazy, then scaled it down vertically to flatten it somewhat. It came out looking like a spiral galaxy. After Effects was used to create all of these effects. To give the scene some activity, I decided to have a small fleet of AirPort base stations approach the galaxy. With After Effects, you just go to the starting point on the time line, then size and position your "spaceships" (mine were initially positioned offscreen). After Effects creates what is known as a keyframe for that point on the timeline. Then you go to another point on your timeline and reposition and resize your objects (my spaceships were scaled to 0% and positioned in the middle of the white Apple logo). After Effects then created a second key frame, and it proceeded to compute all of the positions and sizes for the "in between"' frames. This is also referred to as "tweening." Figure 2. iDisk and the ringed Explorer planet. For the next scene (Figure 2), which was also composited in After Effects, I used Apple's iDisk icon for the front planet and the Internet Explorer icon for the ringed planet. Since the iDisk looks kind of 3D anyway, all I did was resize and reposition it in After Effects. For the IE icon, I edited it a little in Photoshop and then brought it into Cinema 4D and applied the image to an off-white sphere (most 3D apps come with a set of basic solid objects, called primitives, to help in the modeling process; these primitives include spheres and cubes). Then I added a torus primitive to my planet to give it a ring (a torus is a twenty-dollar word to describe a ring or doughnut shape; many 3D animators prefer the term torus because it sounds more technical). I colored the ring to match the blue in the icon and then applied some lighting to cast some shadows. Figure 3. The MSN Borg ship. The MSN Borg ship (Figure 3) was created in Photoshop and animated in After Effects. I had found several images of Borg ships on the web, so I combined and modified textures from several of them to make my own. The MSN logo was done using the Text tools in Photoshop. I also used Photoshop's lighting effects to help make it look more 3D. Figure 4. Gentoo warps into the unknown. The penguin sequence (Figure 4) was all done in Cinema 4D. Most 3D apps contain special objects that serve as lights and cameras. For most of this sequence, Tux/Gentoo remains stationary; I simply animated the camera to do a slow pan around him. In order to retrofit Tux/Gentoo with warp drive, I added two light spheres to his feet. By animating the opacity of these lights from 0% to 100% over time (and adding the warp drive audio file in Premiere later), Tux/Gentoo appears to be blasting off into uncharted territory. And speaking of uncharted territory, what better way to represent the unknown than with a 404- File Not Found browser page? I took a screen shot of a 404 Error page and applied that as a texture to a plane object in Cinema 4D. Then I animated Tux/Gentoo to move through the page. To complete the warping effect, I animated the 404 plane to scale to 0% vertically. Figure 5. The opening title. 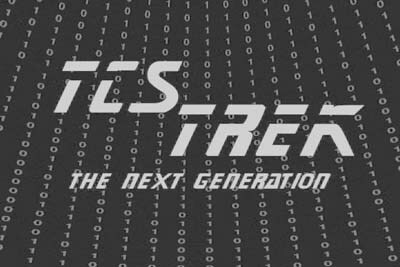 The TCS Trek logo (Figure 5) was created using After Effects and a font that I found on a Star Trek site. The remaining lettering was just a bold, italicized font that was already on my machine, but I don't recall the name (there were about a half dozen that looked nearly identical to me). Figure 6. Gentoo zooms by. The zooming penguin in between the credits (Figure 6) was created using both Cinema 4D and After Effects. In Cinema 4D, I adjusted the camera angle until I had the correct orientation of Tux/Gentoo. Then I rendered an alpha version of the penguin as a single image (the alpha version means that I essentially made the background transparent). Then I brought this image into After Effects and added the digital background. 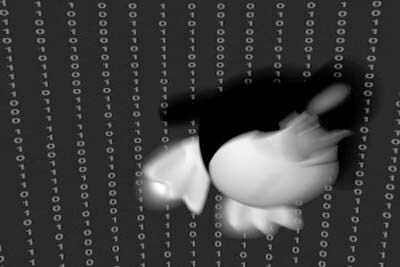 By animating the image's size and position, and adding some blurring to the end of the animation, Tux/Gentoo appears to be zooming by the camera. Adding the whooshing audio sound completes the effect. Figure 7. The first credit. 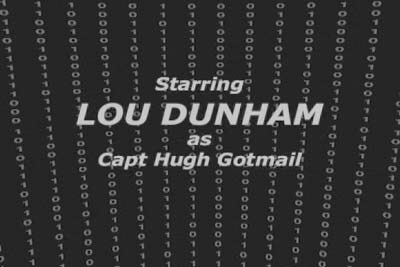 Capt Hugh Gotmail (Figure 7): Why not lampoon AOL? Everyone else does. Router: The first Star Trek had Spock, the second had Data. I kinda combined the two. Since routers were a topic of discussion on the TCS when I came up with this video, it seemed a natural fit. Dr. Viagra Spam: Spam just had to be included in one of the names, since everyone is so fond of it. Since I needed a woman's name (I had Dr Beverly Crusher in mind) Viagra just had a nice ring to it. Mr. Noah Lott: If you are familiar with Lawrence Charters, who often handles the Q&A sessions at the General Meeting, you'll understand why he received this nom de guerre. RAM the Romulan/ROM the Ramulon: Non-techies are often confusing the terms RAM and ROM. Since the Star Trek mythology includes the Romulan race, I thought I would create something just as nonsensical. I like the symmetry. It sounds like something Dr Seuss might have come up with. Six of One/Half Dozen of Another: One of the later Star Trek series introduced a "recovering Borg" named Seven of Nine. This was a jab at her. Ensign Steve Jobs XXV: One of the standard clich's in a lot of military stories is the brash young officer who is the son or grandson of a legend and who is always trying to make his own mark in the world. Since TCS-TNG has a futuristic setting, I decided to add a few Roman numerals to the end of his name, to indicate the passage of time. Colonel Panic: I figured the Mac OS X folks would get the joke, but most others wouldn't. Lt Spam Dailey: This was one of my favorites, but I needed a name for a woman, and Viagra sounded more feminine. Sgt Mack O'Phile: Just couldn't fit it in. It was a last minute idea, and I didn't feel like changing what I had. Billgatus of the Borg: I think I saw this name on a web site somewhere, so I didn't want to use it (even though I parody other people's story concepts, I try to keep my humor original --I do have some scruples). Also, the TCS folks are supposed to be good guys, and the Borg folks typically aren't. The final shot shows Tux/Gentoo warping away. 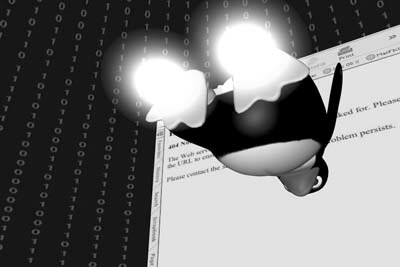 This sequence was produced in After Effects (although the camera angle for Tux came from Cinema 4D). The penguin was simply resized and repositioned. 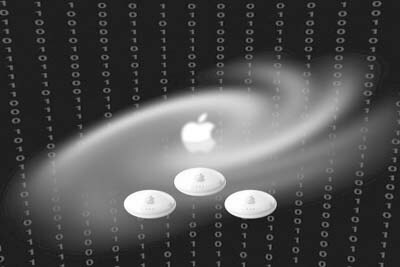 The final Apple logo (Figure 8) was animated using blurring and glowing effects. 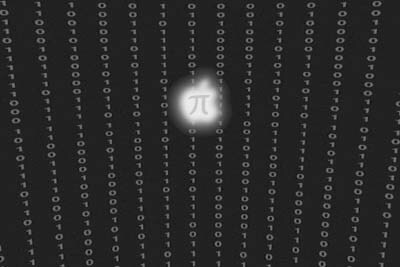 The letter pi was created in After Effects by masking a simple solid color (similar to making a stencil by applying a solid color to a stencil shape). That, in a nutshell, is how I created the video. I didn't go into a lot of specifics here, because my intent was more to inspire, rather than to educate. As I mentioned earlier, a lot of these effects could be created using alternative --and cheaper-- apps. But that is the topic for another article. Figure 8. The final Apple Pi logo.